new publication: Is environmentally induced income variability a driver of human migration? 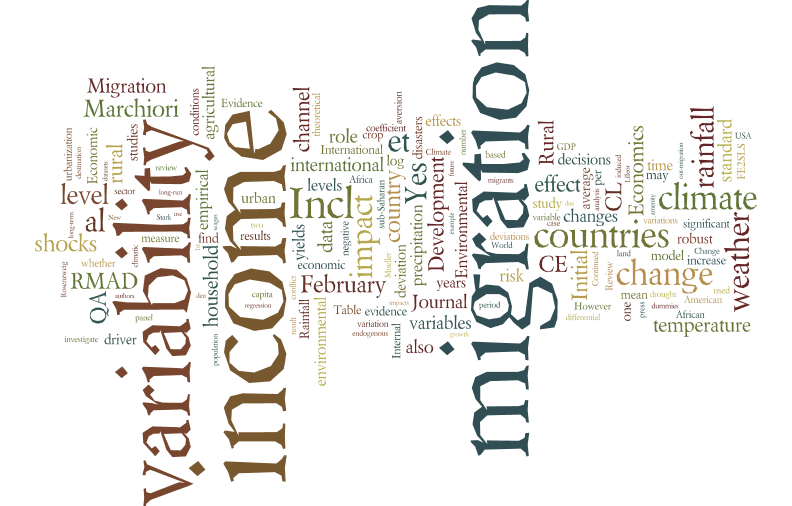 I am happy to annonce that my article entitled “Is environmentally induced income variability a driver of human migration?“, co-authored with Luca Marchiori and Jean-François Maystadt, has been accepted for publication in the journal Migration and Development. Luca Marchiori is a researcher who currently works at the Central Bank of Luxembourg, while Jean-François Maystadt is now a senior lecturer at the University of Lancaster. I have known them both from our time as PhD students in Louvain-la-Neuve, and we have co-authored the article on which this one is built, entitled “The Impact of Weather Anomalies on Migration in sub-Saharan Africa“, which has been published in the Journal of Environmental Economics and Management in 2012. The role of environmentally induced income variability as a determinant of migration has been studied little to none. We provide a theoretical discussion based on a ‘risk aversion channel’ and an overview of the empirical literature on this. We also extend a previous empirical study on 39 sub-Saharan African countries with yearly data from 1960 to 2000 by including income variability and its weather determinants. Our findings lead us to acknowledge that, based on our dataset and methodology, income variability is a negligible driver of migration decisions at the macroeconomic level. There is now a reasonable number of articles, notably starting with the article by Barrios, Bertinelli and Strobl (2006), that investigates inhowfar climate or weather conditions impact migration decisions. where M(n,t) tends to mean rural-urban migration or international migration from country n in year t; CC(n,t) is a proxy for climate change in country n at year t, mostly captured via rainfall or temperature or a mix thereof; X(n,t) is a number of other control variables, like income, wars, political variables, etc; and f(:) is a function which is usually linear. While this is entirely correct, the problem with this kind of approach is that it does not inform us about how climatic factors impact migration – directly via e.g. amenity channels, or indirectly through e.g. reducing income, increasing conflict and wars, or alike. We present a theoretical model that demonstrates how weather anomalies induce rural–urban migration that subsequently triggers international migration. We distinguish two transmission channels, an amenity channel and an economic geography channel. The mechanism of the model is then as follows. Assume we are in an equilibrium where nobody wants to migrate. Further, assume migration decisions are taken based on indirect utility comparisons, where indirect utility is depending on wages and amenity conditions. Finally, assume climatic conditions worsen in one country. Since it is well-known that a worsening of climatic conditions has the strongest impact on the rural sector, then this reduces wages in the rural sector, leading to a gap between rural and urban wages. As a consequence, rural workers have now an incentive to migrate to the urban sector. Consequently, a worsening of climatic conditions in one country leads to a rural-urban migration. In the urban sector, there are now two opposing forces at play. One is that an increase in the urban population has a so-called agglomeration effect. It is a kind of Marshallian externality that increases local wages due to e.g. labor sharing. Since this agglomeration effect has a positive impact on wages, it is expect to further attract migrants from the rural sector, but also now from abroad, since there are higher wages in the urban sector compared to other countries. However, decreasing returns to labor in the production function reduce wages in the urban sector. As a result, if decreasing returns to scale outweigh the agglomeration effect, then the worsening of the climatic condition leads first to rural-urban migration, and then to international migration. We dubbed this channel the economic geography channel. To be precise, it is comprised of an income channel and an agglomeration channel, both working in opposite directions. Finally, there is the amenity channel. It is, for example, well known that illnesses like malaria or dengue increase substantially in some countries with worsening climatic conditions. In this case, migratory decisions might not be based on income differentials but simply be due to quality of life considerations. Based on annual, cross-country panel data for sub-Saharan Africa, we present an empirical model that suggests that weather anomalies increased internal and international migration through both channels. We estimate that temperature and rainfall anomalies caused a total net displacement of 5 million people during the period 1960–2000, i.e. a minimum of 128,000 people every year. Based on medium UN population and IPCC climate change projections, we expect future weather anomalies to lead to an additional annual displacement of 11.8 million people by the end of the 21st century. The results that we present in this article point more towards the importance of the level of income than income variability as a driver of migration at the macroeconomic level. Not only is this suggested through our theoretical model, but also based on our empirical results. However, we also believe that this should not necessarily be the final say yet on income variability versus income levels. As we suggested from the beginning, our approach should be understood as a preliminary step in the analysis of the role of income variability. Why is it so important to study these channels? As I wrote in a previous post, imagine someone tells you that Mr. Waffles is a great baker and he shows you one of his cakes. Observing just Mr. Waffles and the cake does not give you any information on how to actually make the same cake. You need the recipe in order to reproduce or improve the cake. And the same holds for being able to address migration and its determinants. If you want to reduce the incentives for migration and you only know that there is an impact from climate change to migration, then you obviously know that you have to reduce climate change in order to minimize migration. But if you know the channels through which climate change impacts migration, then you are able to address more specific aspects. For example, if we were to presume that we can do little about climate change, but we know that the amenity channels plays a significant role for migration, e.g. due to more malaria, then we may wish to address malaria directly, which may thus switch off a significant part of the amenity channel. Or, as our article has shown, we know that income variability is not one of the main determinants of the climate-income-migration relationship, then we know that we do not need to address to place much emphasis on issues of income variability (thus place e.g. less emphasis on insurance), but can focus on other channels like the amenity channel or the income change channel. Luca Marchiori is currently working in the research department of the Central Bank of Luxembourg, Luxembourg. During the preparation of this article he held a research position at the University of Luxembourg. His research interests are mainly focused on issues of migration or pensions. His recent publications include journals such as Economic Inquiry, Journal of Environmental Economics and Management, and the Journal of Population Economics. Jean-François Maystadt is a senior lecturer at the Lancaster University, United Kingdom. He is a development economist specializing in the study of Conflicts, Natural Disasters and Forced Migration. His current research is related to the causes and consequences of conflicts and forced migration in Central Africa, Eastern Africa, Asia, and the Arab world. He published in journals such as Oxford Economic Papers, American Journal of Agricultural Economics, and Journal of Environmental Economics and Management.